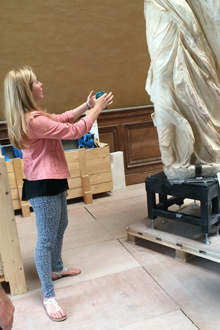 Winged Victory of Samothrace went back on display in the Louvre in July, restored to a beautiful, translucent white. Photo by Antoine Mongodin / Musee de Louvre. The work of Emory scholars has helped return one of the most famous statues in the world to one of the most famous museums in the world. 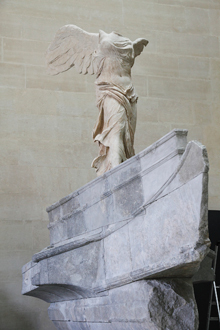 The Winged Victory of Samothrace returned this month to its place atop the Daru staircase in the Musee de Louvre in Paris after almost a year of conservation and restoration. "When you next go to the Louvre, you'll be seeing a whole new girl, so to speak. She is so amazingly cleaned up that it's going to be a real pleasure," says Emory art history professor Bonna Wescoat. The Winged Victory is one of the five most popular works at the Louvre, which attracts almost 10 million visitors a year. The 2,200-year-old, 18-foot-high statue was taken off display in September 2013 to be cleaned. "The statue has gone from being a dark, kind of mustard-y brown to being a beautiful translucent white," Wescoat says. "When the light from the windows came into the room where the Louvre conservators were restoring her, you could see right through parts of the statue. It just glows; it's remarkable." Emory art history professor Bonna Wescoat (right) and Ludovic Laugier, head of the Louvre's Antiquity department, determine the original position of the 3D printed scans of fragments from Samothrace on the marble warship that supports the Winged Victory. Photo by Nathalie Bruhière / Musee de Louvre. Wescoat is director of excavations in the Sanctuary of the Great Gods on the Greek island of Samothrace, the original home of the Winged Victory, also known as the Nike (Nee-kay). She is also a member of the small international team of French, Greek, German and American archeologists who advised the Louvre in cleaning the statue and reassembling the base on which it stands. That base is in the form of the prow of a warship, and the Louvre team looked very carefully at the relationship of the statue to its base, which is where Emory's role came into play especially. Most of the base is in Paris, except for the central internal block and numerous smaller fragments, "including four more that we found last summer" during cleaning operations in the Sanctuary on Samothrace, Wescoat says. "We especially collaborated on integrating exact copies of the fragments of the statue on Samothrace, mostly from the marble prow of a warship on which the figure stood, into the new restoration," she explains. "Little of the statue remains on Samothrace today. But the fragments we do have make a very important contribution," she notes. "After intensively studying the Samothracian fragments, we three-dimensionally scanned them on Samothrace and they were printed in Paris. We then were able to make exact matches to their correct position," she says, explaining Emory's work to resolve some key issues concerning the design of the statue and the prow on which she lights. Wescoat first worked as a student in the Sanctuary of the Great Gods in 1977. For the past several years she has led a team of scholars and students from Emory and New York University's Institute of Fine Arts studying the Sanctuary of the Great Gods on Samothrace, including the Winged Victory's original home. "Nike is the personification, the embodiment of victory in war or in competition," Wescoat says. "We see her hovering over contestants in scenes of chariot races, crowning the victor, or making offerings; statues of Nike are often dedicated in sanctuaries as symbols of a victory." The Samothracian statue was cleaned up in honor of the 150th anniversary of her discovery in 1863 by Charles Champoiseau, then French Vice-Consul to Turkey. Most of the statue was taken to the Louvre in 1864. Working on the Nike and her precinct, that is, where she was situated on Samothrace, "has been a wonderful collaboration of committed scholars and good friends," Wescoat says. "Together, we have made many more discoveries and have advanced our understanding far more than if we had worked separately." But work on the statue doesn't end with the restoration. Abigail Green, an Emory junior majoring in sociology and integrated arts, discusses the drapery of the Winged Victory prior to its reinstallation. Photo by Nathalie Bruhière / Musee de Louvre. "While the restoration of the statue is complete, we still have a great deal more work to do to understand the many aspects of this masterpiece," Wescoat acknowledges. "Our role, particularly, includes determining the kind of monument that framed the Nike: Was she within a closed building, or an open precinct? We also want to understand better her relationship to the theater [in the Sanctuary of the Great Gods], so we are working on that structure this summer." Wescoat says the placement of the Winged Victory on Samothrace was "brilliant" as "the statue served as the visual pivot" for the Sanctuary of the Great Gods. From its vantage, it likely was visible from the sea as well. "In addition to our work on the Nike and her precinct this summer, we are investigating a rediscovered plan of the South Nekropolis and completing a new topographic plan of the Sanctuary. Our major campaign over the next years will be to complete the research and publication of the major monuments in the western area of the Sanctuary," she says. Wescoat describes the area as the "entertainment zone." Pilgrims came to the island and completed an initiation after which "they celebrated with feasts set in fancy dining rooms, and theatrical performances. This was also the region where great dedications to the gods were made, including an entire warship, and of course, the Nike." This year's annual Samothrace Lecture will be held Tuesday, Oct. 21, at 7:30 p.m. in the Michael C. Carlos Museum Reception Hall. Wescoat will discuss both the collaborative work of the restoration of the Winged Victory and the rediscovery of the lost plan of the South Nekropolis, plus ongoing work to recover the design of the theater, and new ways of 3D spatial modeling using photogrammetry, a new technology spearheaded by Michael Page of the Environmental Sciences Department. She notes that working on this project "has offered an invaluable opportunity for our students to be involved in the restoration of a world masterpiece, working with some of the foremost scholars in the field. Every time they see the Winged Victory, they will remember their experience." 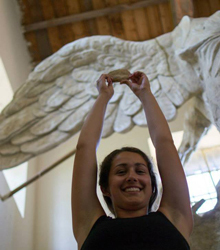 Hannah Smagh, an Emory senior majoring in Ancient Mediterranean Studies, holds the tip of a feather against the cast of the Winged Victory in Samothrace. Photo by Claire Mullins. One of the mysteries of the Winged Victory is her wings, or rather the one wing that has survived. "The primary feathers of the Nike are unlike those of birds in nature and also of wings generally represented in ancient Greek art," Emory art history professor Bonna Wescoat told an audience in April for the second annual Samothrace Lecture at the Michael C. Carlos Museum. She and SIRE student Daniel Majarwitz spent the spring comparing the Nike's feathers to hundreds of other representations in ancient art, as well as to a wide range of differ types of birds known to exist in the Mediterranean in antiquity. "For this curiosity, I currently have no explanation," Wescoat said. The feather tip, the only securely identified fragment of the Nike herself now on Samothrace, was discovered to the north of the monument in 1962. "If we cannot find a place for our feather on the left wing, then we'll have to consider the possibility that the missing right wing was made of more complex construction of at least two different kinds of marble," she says, referring to the slightly different composition of the marble used in the feather fragments for the right wing now in Paris. "Are her feathers ruffled? Nothing so far explains the overlapping of the primary feathers, and their density," she surmises. "This is what catches us by surprise."